Glycopyrrolate bromide is an anticholinergic drug with competitive antagonism of the muscarinic effects of acetylcholine. Neostigmine methylsulfate is a cholinesterase inhibitor which increases the effects of acetylcholine at cholinergic synapses through competitive inhibition of the cholinesterase enzymes. 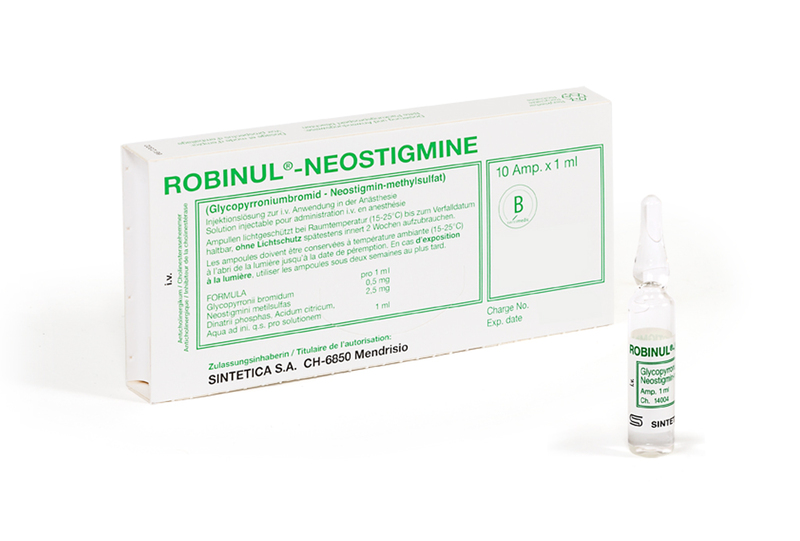 The combination Robinul-Neostigmine can reverse the moderate residual nondepolarizing neuromuscular block during and immediately after general anaesthesia without anticholinergic side-effects. It provides prolonged protection against bradycardia, increased oropharyngeal secretions and bronchospasm.